a note from apple seeds: have you heard about my super cool business partner? have you heard about my super cool business partner? For anyone who reads this blog you know that my business partner Alison has done some pretty incredible things in the past few years. In 2012 she did 15 yoga classes in 1 week. In 2013 she completed a Half Ironman. In 2014 she helped guide a blind athlete from the South Rim to the North Rim of the Grand Canyon and back again -- nonstop. 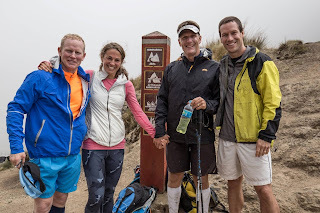 This year she helped guide that same blind athlete from the Inca Trail to Machu Picchu -- nonstop. The Grand Canyon and the Inca Trail had never been done by a blind athlete before, so not only were these challenges awe-inspiring, they also were history making. But at the Half Ironman Alison met a guy named Dan Berlin. Over the course of 20 years, Dan lost his sight to a rare eye disorder called cone rod dystrophy. Alison was incredibly inspired that Dan focused on his ability to run, bike and swim and not his sight disability. Dan and Alison became fast friends. After the Half Ironman, Alison, Dan and Dan’s running guide (and Alison’s friend), Charles Scott, and Charles’ friend, Brad Graff, decided to do another fitness challenge together. That was the Grand Canyon. After the Grand Canyon they decided to make things official. First Alison, Dan, Charles and Brad created Team See Possibilities. Then they created a formula of 3 criteria that all future adventures had to meet. They even got a sponsor – Intrepid Travel (check out their web site for immersive adventurous trips for normal folk) and they were off. 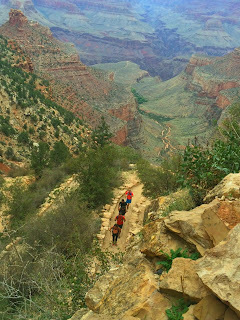 Anyone who reads about these adventures immediately can see that they are athletically amazing – mind blowing. But taking on these challenges is no longer about just daring and testing herself physically. Team See Possibilities has come to encompass everything Alison cares deeply about. Alison loves children. Hers of course -- wholly and unconditionally. She is an incredible and devoted mother. But she lights up when she sees any child. Alison loves travel. She loves seeing new places, meeting new people and diving into new cultures. You can name any town in any country in the world and Alison can come up with someone she knows that lives there. Alison loves helping people. She raises money for multiple causes at once and when she is not raising money she is finding ways to give back through time and effort. Alison loves exercise. Any kind at all…but in particular yoga and in more recent years running. When Alison left her job at UNICEF to start apple seeds (with me!) she knew it was right for her family but she did not want to completely lose her access to international travel or meeting and helping children of the world. For each of these adventures Alison has been worried about the time she has to take away from her kids to appropriately train. Getting her body and mind ready for these challenges takes real effort and time. She runs, she cross trains, she spins and she does yoga. That means missing school drop off, pick up or after school activities, at times, to exercise. It also means motivating to get out of bed and out of the house to go on group runs on Sunday mornings. But today I saw it all come together for Alison. Today, I sat in an audience of 5th and 6th graders. Two of the 5th graders were Alison’s daughters, Maddie and Sydney. I was at their school to see an assembly about adventure and possibilities. Alison and her Team See Possibilities teammate, Charles, led it. Alison and Charles were there to show the kids that by focusing on his abilities, not his disability, Dan, is showing each of us how to overcome the limits we often place on ourselves. But this assembly was not just about Dan. It was about all of us…with an emphasis on those 5th and 6th grade kids and what they can set their minds to accomplish. Alison spoke about how she set goals of physical challenges (to encompass in her love of exercise). She showed gorgeous, sweeping pictures of the Grand Canyon and Macchu Picchu (to encompass her love of travel and this world we live in). She spoke about working with UNICEF to meet blind children in Lima and provide them with both inspiration, and a role model in Dan, and musical instruments sorely needed for their school (encompassing her need to connect with and help children). But the best part of the assembly was seeing that her deep, unconditional love for her children was reflecting right back at her as her daughters sat in the audience beaming at their role model for possibilities…their mom.